BSJ | What are the consequences of conflating the Middle East with the Muslim World as geographical designations? The exonymic neologism ‘Middle East’ was coined by US Navy Captain Alfred Mahan in 1902 in an attempt to delineate a seamless territory centering on Persia, Mesopotamia and the Persian Gulf (Culcasi, 2010, 585). Since then, the term has been used to describe a plethora of countries, spanning three continents, contributing to its obfuscation as a geographical and cartographic object. This confusion is caused because the Middle East is an abstraction of various distinct and heterogeneous countries which have little physiographical, geographical, historical, cultural, or political unity. In attempting to categorise the Middle East, it is often mistakenly conflated with the Muslim World. However, as I will demonstrate, this is an unacceptable amalgamation, which leads to a parochial and Orientalist conceptualisation of both the Middle East as a region, and Islam as a religion. 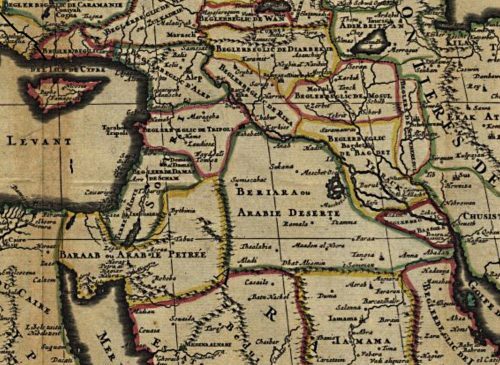 Before dismantling the current justifications for conflating the Middle East and the Muslim World, it is necessary to highlight the semantic limitations and insufficiencies of the respective terms. The problematisation of these terms is crucial because as categorical designations they attempt, erroneously, to order and group amorphous diversities. The ‘Middle East’ ‘correspond(s) to no stable reality that exists’ (Said, 2003, 331), whilst the ‘Muslim World’ reduces a diverse group of disparate believers into a single object (Ahmed, 2016, 109). Each Middle Eastern country is unique, containing different histories, ethnicities and religious majorities, whilst Islam is a collection of distinct denominations. There is no unanimous agreement on what constitutes orthodox and heterodox, what is interpretation and misinterpretation and practices vary according to family values and local custom. Thus, as Brown argues, we really should speak of differing ‘islams,’ each with a lowercase I (2009, 4). Our linguistic shortcomings and crass use of language play a fundamental role in our misconception and imaginative representation of the Middle East and the Muslim World. It is true that historically Islam emerged in Arabia and spread under the Umayyad, Abbasid and Ottoman empires to boundaries which are today deemed as the ‘core’ Middle East (Keddie, 1973, 257), suggesting, as Peter Holt and Bernard Lewis argue, a definite historical identity (1962, 2-3). However, the aforementioned empires were neither coherent nor unified and, although all were proponents and bastions of some form of Islam, they practiced and preached differing islams, leaving no single ideology or legacy. Like all empires, they are better defined by their common desire for power, territory and wealth. Furthermore, the conflation is anachronistic in that the region has changed and developed politically, culturally and socially since the fall of these empires. Likewise Islam has changed massively, particularly because of the centrifugal forces of colonialism, modernity, industrialisation and conflict, and the religion continues to evolve with time. Holt and Lewis’ ahistoricism is harmful because it fuels a teleological study of the Middle East which clumsily links modern nations to their ancient past and contributes to the perception of the Middle East as a primitive and antique region, centered upon a monolithic Islam. Finally, conflating the Middle East with the Muslim World engenders a belief that instability in the region is caused by religion. The term ‘Middle East’ has recently been used to include certain East Asian countries on the peripheries of the region, for the basic reason that they have become associated with Islamic terror and fundamentalism. In fact, the suggestion that a conservative and repressive Islam is the cause of ‘backwardness’ in the Middle East has been used to justify Western hegemony in the region and legitimise destructive U.S. foreign policy such as the 2003 invasion of Iraq, which came just 18 months after 9/11. In 2002 Hammond published a map including Afghanistan in its delineation of the Middle East, and in 2004 the George W Bush Administration used the label to refer to Pakistan (Culcasi, 2010, 589). It is no coincidence that these changes coincided with Taliban ascendancy in both countries and raising concerns in the West about violent Islamism. This perception of the Middle East as any place which houses radicalism and violence describes a problem, not a region; a western psychological projection, not a geographical entity. Conflating the Middle East with the Muslim World is therefore harmful because it suggests that the root of the ‘problem’ is Islam and that Muslims, as enemies of the West, perpetuate this problem (Turner, 2006, 204). This is a reductive stereotype which overlooks the instability more strongly correlated with poverty, imperialism, colonisation and war. The Middle East is a region which has shown more diversity than unity and, like Islam, is a heterogenous entity resisting categorisation (Keddie, 1962, 56). The terms ‘Middle East’ and ‘Muslim World’ serve to create artificial entities which are ‘Other’ and intrinsically different from the ‘West,’ thereby overlooking the different historical, social and political factors which create the modern nation and the modern Muslim. Conflating these terms is ahistoric, because it neglects the spread and development of Islam across the rest of the World and defines a Muslim identity restricted to a Western version of an ancient Islam out of Arabia. Furthermore, conflation of the Middle East and the Muslim World creates a causal link between Islam and the current instability in the Middle East. ‘Critiquing the foundational myths of the region provides an essential component for critically examining our everyday, taken-for-granted imaginings’ (Culcasi, 2010, 594). We must liberate ourselves from our unfounded, constructed fictions, thereby liberating those to whom we have given reductive and harmful nomenclature.